Onam falls on September 13, 2016. Onam is the major holiday of the people of Kerala, a state in southwestern India. Onam is a harvest festival, but it also has mythical connections. Every year during Onam, the king of yesteryear, King Maveli, comes to visit. Many moons ago, King Maveli was banished from his kingdom (Kerala), with the promise that he could visit every year during Onam. This Onam story is depicted in the flower design, to the right. 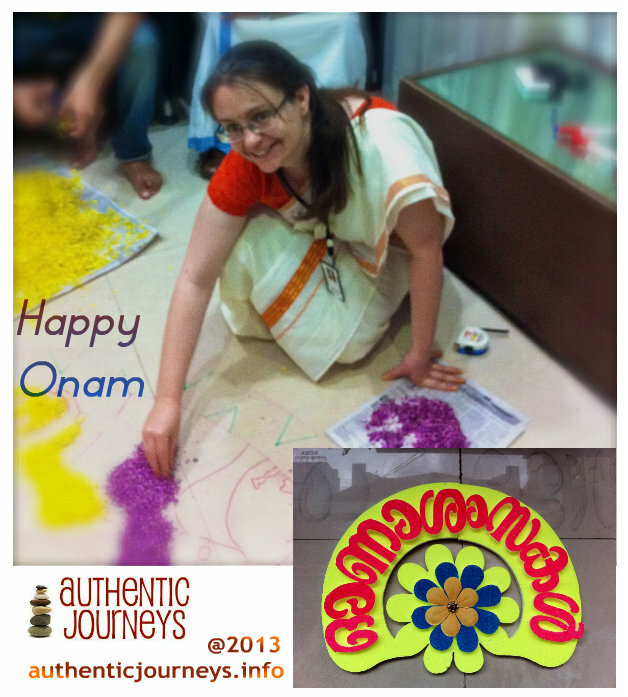 Onam is a 10 day festival. While many school and college students do have holidays for up to two weeks, working professionals may have one or two days off. 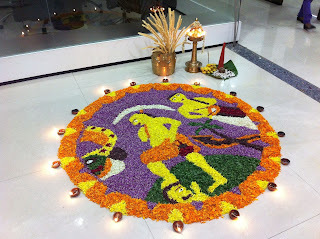 Typically for a week before Onam schools, colleges and office places all have Onam programs. Onam programs include cultural programs such as singing, dancing (thiruvathira ladies dance), skits (one skit may include the story of Onam and King Maveli), and competitions. Competitions include tug of war, eating contests (idli eating contest, for example), musical chairs, egg and spoon race, fancy dress competition, pookkalam (flower arrangement) competition, and others. Last but not least, no Onam party worth it's salt is complete without a feast. The feast (Onasadya) is also relished by one and all. Authentic Journeys initiated it's office in the Non-Resident Indian - The Business Incubator (NRI-TBI), Infopark in early 2013. Being that 2013 was the first year of incubation at NRI TBI, it was a great experience for me to participate in the Infopark wide Onam festivities. While bigger companies may celebrate for two or three days the week prior to Onam, smaller companies participate only on one day, the day before the Onam holiday. 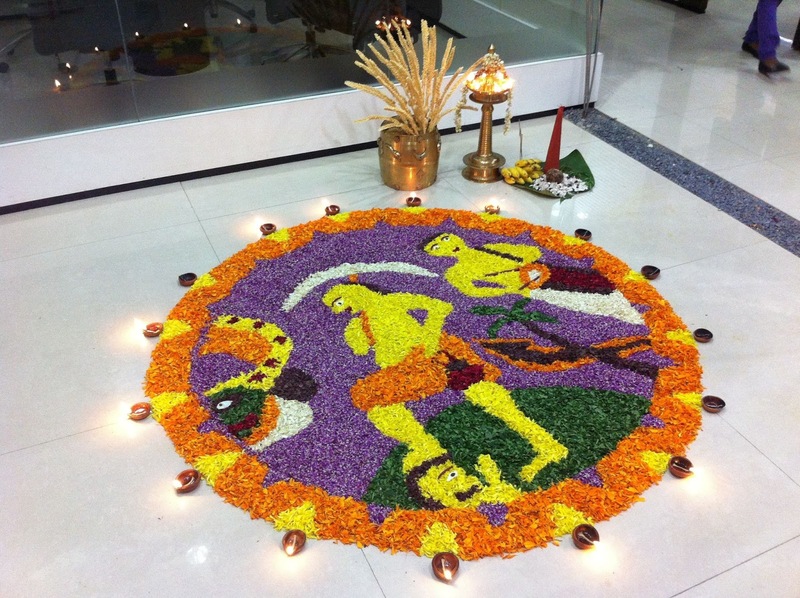 One of the Infopark wide competitions is the pookkalam competition. As I do not have employees, my colleagues included about 15 other employees of the companies in the NRI TBI incubator. It was a great experience to complete this pookkalam with this team. In fact, it took all of us 15 team members more than FIVE hours to coordinate and put together this arrangement. This is five hours of continuous work. Completing such a pookkalam alone in this amount of time seems unfathomable, let alone not as enjoyable as it is with the group. P.S. Take note, for US clients or colleagues working with Indians based in Kerala, these festivities literally take up a whole day of work in smaller companies. In larger companies, some may spend two or three full days celebrating.